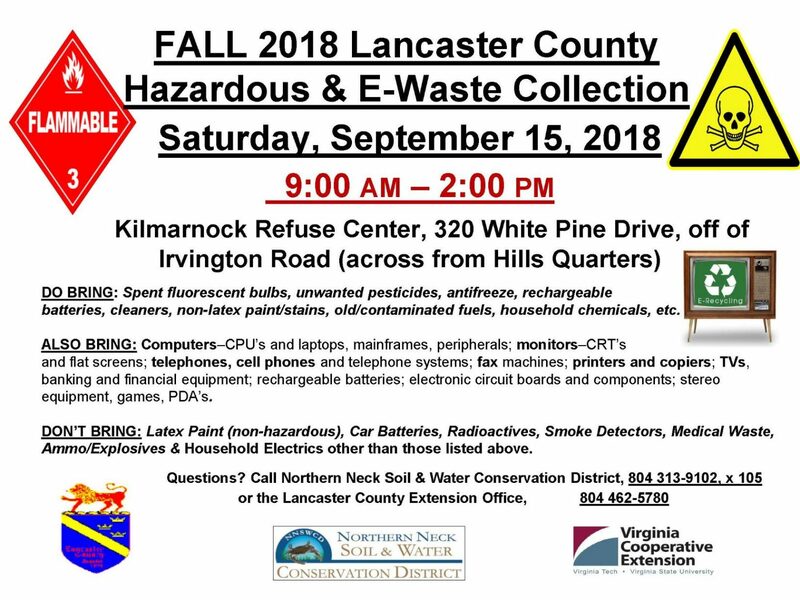 The 2018 Fall Household Hazardous Waste and Electronic Waste Collection for Lancaster County will take place Saturday, Sept. 15 from 9:00 am to 2 pm at the Kilmarnock Recycling Center, 320 White Pine Drive (located off of Irvington Road) in Kilmarnock. This collaborative effort between Lancaster County, Virginia Cooperative Extension, and the Northern Neck Soil and Water Conservation District gives Lancaster County residents an opportunity to safely dispose of household chemicals and other substances that pose a danger to the environment if not disposed of properly. Please bring used gas and oil, oil based paints, pesticides, fertilizer, old cleaning products, solvents, anti-freeze and spent florescent bulbs. Do NOT bring: Latex paint (it can be dried out and disposed of in the garbage), ammunition, radioactive materials, tires, car batteries, medical waste, or prescription drugs (prescription drugs may be taken to the Lancaster County Sheriff’s office).